A suicide attack is an attack on a military or civilian target, in which an attacker intends to kill others, and knows that he or she will most likely die in the process. The means of such attacks have included vehicles filled with explosives, military planes intentionally crashed into ships, passenger planes carrying large amounts of fuel crashed into civilian buildings, and individuals wearing vests filled with explosives. Synonyms include suicide-homicide bombing, martyrdom operations, and predatory martyrdom. Strictly speaking, an attack may not be considered a suicide attack if the attacker is not killed. Although suicidal attacks have occurred throughout history—as with Samson's suicidal destruction of a Philistine temple (as recounted in the Book of Judges) and the Japanese kamikaze pilots of World War II—their main notoriety in recent years have come following the success of a 1983 truck bombing of two barracks buildings in Beirut that killed 300 and helped drive American and French Multinational Force troops from Lebanon. The first contemporary-style suicide bombing—involving explosives deliberately carried to the target either on the person or in a civilian vehicle and delivered by surprise—was in 1981. It was perfected by factions of the Lebanese Civil War and spread to insurgent groups such as the Tamil Tigers of Sri Lanka, Palestinian terrorist groups, Al-Qaeda, and by 2005 to dozens of countries where a weaker power is fighting a stronger one. Particularly hard-hit have been military and civilian targets in Sri Lanka during Sri Lankan Civil War, Israeli targets in Israel since 1994, the United States in the attacks of September 11, 2001, and Iraq, Afghanistan, Indonesia, and Pakistan in recent years. 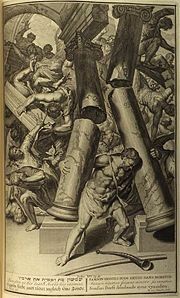 Samson's destruction of a Philistine temple, killing himself and thousands of his enemies, may be the earliest known example of a suicide attack. Historically occasional acts of suicide for a military objective have been considered morally acceptable or even heroic, such as a soldier placing himself in harm's way in order to take out a strategically placed enemy machine gun nest. In the Bible, the judge Samuel—who had been blinded and imprisoned by the Philistines as a result of his relationship with Delilah—redeemed his earlier sins by sacrificing himself to bring down a Philistine temple on the heads of his enemies and himself. However, intentional acts of suicide to bring about the deaths of civilians are normally considered acts of terrorism. The term "suicide attack" dates back to the 1940s, when it was used in reference to certain German and Japanese battle tactics, but did not gain its present meaning until 1981. Various alternate terms have been used to frame the act differently: the Muslim use of the word shahid (martyr) for the bomber or martyrdom operation for the bombing emphasizes the self-sacrificial aspects, while the term "homicide bombing" emphasizes the fact that the bomber engages in a premeditated act similar to mass murder. In the book, Dead for Good: Martyrdom and the Rise of the Suicide Bomber (Barlow 2007), Hugh Barlow describes a new development in the long history of martyrdom, describing suicide attacks as "predatory martyrdom." Contemporary suicide attacks usually involve explosive materials such as a bomb (a "suicide bombing"), and are often carried out with the help of vehicles. The strategic rationale may be military, political, or both; the target may be military, in which case the bombing is usually classified as an act of war, or civilian, in which case it is usually considered terrorism. Military historians classify suicide bombing as a form of armed violence, belonging to the tactics of asymmetric warfare—when one side in a violent conflict lacks the means for effective, conventional attacks. The cost-benefit analysis, as expressed by al-Qaeda leader Ayman al-Zawahiri, is simple: "The method of martyrdom operation [is] the most successful way of inflicting damage against the opponent and the least costly to the mujahidin in terms of casualties". Advantages of suicide attacks include the ability to conceal weapons, make last-minute adjustments, increased ability to infiltrate heavily guarded targets, and the lack of need for escape plans and/or rescue teams. Civilians are the favored targets, being easier to attack than fortified installations, armored vehicles, or armed and wary soldiers. The consistent targeting of civilians, however, may call into question the moral legitimacy of the bomber's cause. Suicide operatives are overwhelmingly male in most groups, although female suicide attackers are not unknown. Responses and reactions to the suicide bombing are mixed, so that a full assessment of the action's impact—especially whether it helped or hindered the cause in whose name it was carried out—is difficult. The public response of politicians is usually one of determination and condemnation. Military and law enforcement are mobilized to disrupt or destroy the organization which planned the attack. The root cause of the violence is often obfuscated by the occupying power in order to avoid discussion of the military occupation that evokes the violent countermeasures. Often the bomber is portrayed as irrational and motivated by blind hatred. Those who support a suicide bomber's cause will often hold him up as a hero. For example, the Tamil Tigers in Sri Lanka, publish celebratory books containing the photos of those they regard as heroic freedom fighters; militant Islamist groups like Al Qaeda make use of religious language to lionize suicide bombers, calling the bomber shahid, or "martyr." In the case of using explosives, a suicide attack does not require remote or delayed detonation. In the case of causing a crash, it allows human guidance of the weapon (carrying it, driving a car or boat, flying a plane, etc.) without the need for remote or automatic control as in a guided missile. The attack scenario also has the advantage of not requiring a plan on escaping to safety from the enemy after the attack. 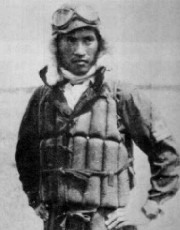 Kamikaze leader Lt (Chui) Yukio Seki wearing a life preserver. Suicide attack by a boat with explosives: USS Cole bombing, attacks in Sri Lanka by the LTTE Sea Tigers. Suicide attack with guns: Kashmiri insurgents on the Indian Parliament in December 2001 killing, 15 people. Suicide attacks usually (but not always) target poorly guarded, non-military facilities and personnel. They can be either a military tactic, a political one, or a mixture of the two. 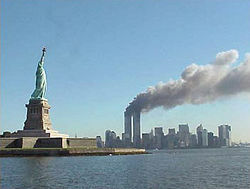 Such attacks may qualify as terrorism when the intention is to kill, maim, or otherwise terrorize a predominantly civilian target population, or may fall within the definition of an act of war when it is committed against a military target under war conditions, as in the case of kamikaze attacks. 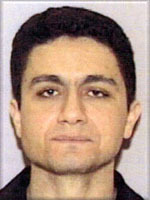 Mohamed Atta, one of the 9-11 suicide attackers. The doctrine of asymmetric warfare views suicide attacks as a result of an imbalance of power, in which groups with little significant power resort to suicide bombing as a convenient tactic to demoralize the targeted civilians or government leadership of their enemies. Suicide bombing may also take place as a perceived response to actions or policies of a group with greater power. Groups which have significant power have no need to resort to suicide bombing to achieve their aims; consequently, suicide bombing is overwhelmingly used by guerrilla and other irregular fighting forces. Among many such groups, there are religious overtones to martyrdom: attackers and their supporters may believe that their sacrifice will be rewarded in an afterlife. Suicide attackers often believe that their actions are in accordance with moral or social standards because they are aimed at fighting forces and conditions that they perceive as unjust. In the case of the kamikazes, the tactic represented a situation of desperation in which Japanese commanders realized that the war in the Pacific had turned dramatically against them; it also conformed with ancient Japanese military tradition in which suicide was considered a more noble fate than defeat or capture. ↑ Excerpts from Al Qaeda leaders www.intelcenter.com Retrieved January 27, 2008. This page was last modified on 26 October 2015, at 14:30.